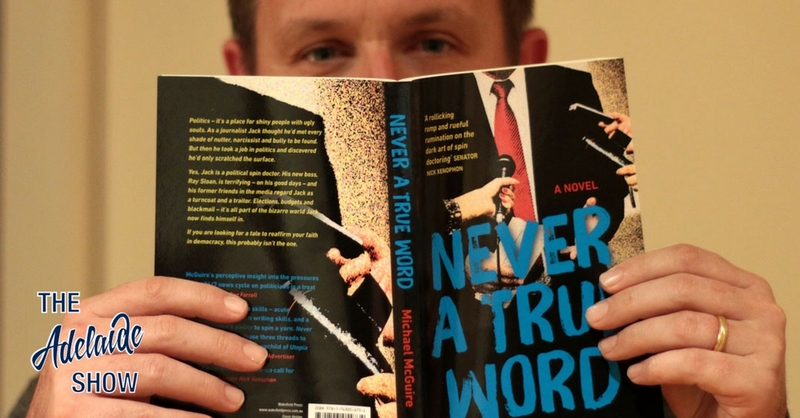 Michael McGuire is a journalist with many years experience at The Australian and The Advertiser, where he is now senior writer, and formerly a “spin doctor” for South Australian treasurer, Kevin Foley, so it made him the perfect person to write Never A True Word, an authoritative novel about modern day politics and its bedfellow, journalism. at the Advertiser and has captured . Nigel will try to stump us, virtually, with IS IT NEWS on the topic of propoganda. In 100 Weeks Ago we hear from Rilka Warbanoff, about the secret world of executive networking. And in the musical pilgrimage … our musical curator has picked a track by Superdose Gangway which he says is perfect but comes with a language warning..
Will you be offended by language? We have been trying to keep this a secret but I can’t any longer. Nigel and I are down to the final two blogging and podcasting duos, being considered to walk a world heritage listed spiritual path in Japan in November. One thing we need to ponder is gifts. What gifts would signify SA and be appreciated in Japan? In his novel, Never A True Word, Michael McGuire confirms every darkest fear I have ever held about our political and media systems. The focus is always on re-election rather than schemes of grandeur for our betterment. And, even worse, the novel’s critique of our media, which is meant to be our watchdog, boils down to a barnyard of egos all vying to place themselves into the frame of history. As our protaganoist exclaims, parliament boils down to theatre for bad actors. The sad thing is, we only get to give these actors a review every four years. And my problem is, I would like to look forward to rewarding them, not punishing them with my vote. Michael Maguire, welcome. Frontline, House Of Cards, West Wing, The Newsroom, The Thick Of It, all these shows should have prepared me for your novel, but they all look like confection, compared to yours. Do you still get invited to media launches and events? I heard at Doug Robertson’s farewell you squeezed it in at night. Why did you need to write this? At one point, Ray Sloan, the state treasurer, has a hard-nosed journalist on his trail and our hero, Jack, who had just been despising his boss, gets back into the saddle to save his reputation. But you note it is not because Sloan is worth it, it is because the mutal hatred towards the journalist is a uniting force. Is the political landscape just a microcosm of life on earth, where ego and pride bind or separate people? In the story, despite the journo demanding to speak to Sloan, they send a three sentence statement. He asks if this will make her mad but the logic is clear: she is out to get you, this way you are part of the story but you don’t risk giving any other details. There was a time when government ministers banned Matt and Dave, it shows that people need to be willing to have their backsides flogged in public for these shows to have their oomph. It is a delicate balance act of mutal need, is it not? In this incident, the story is averted but the narrator says he would have found the worst photo of Sloan and done a graphic of Sloan’s misdemeanours. When does such treatment leave simple journalism and become editorialising? POLITICAL offices are the oddest of environments. They give rise to delusions of grandeur you won’t find in your ordinary work setting. Even working in the ego pit that is the newsroom of your average daily metropolitan newspaper has nothing on politics. I have seen the most mild-mannered, self-effacing people enter the world of politics and quickly become entranced by the power and the influence. Politics is the only workplace where a half-smart twenty-something can issue instructions to a 50-year-old career public servant and demand to be taken seriously. There is a point when Sloan apologises and then reflects on whether he can fight on. He says the press smell blood and that’s the end of it. What can you do as a pollie? And how lazy do you think the resignation calls are? Also, when the treasurers says out loud he might resign, the spin doctors worry about their own jobs. One concern is they won’t get jobs again because they’ve burned bridges. How true is that? As expected it’s the city’s number-one radio prick who has used his pudgy little fingers to press the numbers that will bring his voice to my ear. A man who inflicts his loud and often nonsensical opinions on the public each day and who considers each and every utterance to be a veritable nugget of truth. A man who has confected outrage down to such an art it could be hung in the Louvre. In other words, your bog-standard radio shock jock. Every city has one these days and this bloke is ours. It pains me more than I can say that I have to be civil to this enormous fuckwit. “No one takes breakfast radio seriously apart from the presenters, policiticians, and their staff members.” It does seem like a game. However, in the latest ratings, 5AA is edging closer to Matt and Dave in breakfast. Talk dominates. Is it perhaps more valuable than your character concedes? “The Nazis do not send their members and prominent people abroad for nothing,” said Dr. Alan Finger yesterday, when he spoke at a crowded meeting of i when he spoke at a crowded meeting of, the Adelaide University Politic:- and International Relations Club at the Lady Symon Hall. Dr. Finger was referring to the proposed visit of Count von Luckner to Australia in July. The doctor based his talk on Nazi organisation and more especially dealt with its power in the present Spanish situation. Reference was also made to the channels through which the Nazis worked their propaganda in other countries. The thoroughness of the Nazi .power and its relationship with radio were stressed by the speaker, who added that the shortwave broadcasts in Germany were the most efficient in the world. with the people that railways and reticulation schemes were needed in the district—not those who said “No” when the people asked for such advantages. That is why you have your rotten politicians. I am not speaking as a member of any party, said Mr Whitford, but as a free man with opinions to express. Anybody who wants my job can have it tomorrow. I am done with it. I am quite prepared to go out of public life, but some people have asked me to stay in polities, so I am going-to stay. Stating that he had received complaints from many school teachers that they had not all been supplied with copies of a speech made by the Chief Secretary (Mr. Whitford) about State enterprises and a newspaper cutting containing “that memorable statement” about “fooling the electors,” Mr. Nieass (Socialisation Party) in the Assembly yesterday asked whether the Premier (Mr. Hill) would enquire as to who was responsible for the censorship of political matter in State schools. Mr. Nieass said that he wanted to make it clear that the Director of Education knew nothing about the distribution of political reporting in State schools. He himself said it was important for students and our future leaders to understand and how our political process worked. The Premier promised to make the enquiries requested. This week, in 100 Weeks Ago, we hear from master cook and networker, Rilka Warbanoff, on her successful approach to getting things done by bringing people together for networking over meals. And our song this week is Call Me Anything You Need by Superdose Gangway, selected by our musical curator Dan Drummond.